The ability to recognise individuals within a population or social unit and track them over a period of time can provide important information for the management of a species. Individual identification can provide data on animal behaviour (group composition, social relationships, reproductive condition), ecology (ranging patterns, site fidelity, habitat use), and population biology (age at sexual maturity, calving intervals, survivorship and life span). Since 1912, hot brands have been used to give unique identifying markings to numerous pinniped species (e.g. northern fur seals, southern elephant seals, grey seals). Brands are heated to red hot and applied with firm, even pressure for 2-7 seconds. Some of these marks have remained readable for up to 20 years. Freeze branding has also been used on both pinniped and cetacean species (e.g. Australian sea lions, bottlenose dolphins). Freeze branding differs from hot branding in that it involves the selective killing of pigment-producing cells through contact with a super-cooled metal symbol. These brands are generally shorter-lasting than hot brands, and many re-pigment within 1-2 years; although, brands of up to 7 years have been observed. However, researchers are increasingly relying on individually distinctive natural features to identify animals. Cetaceans exhibit a variety of unique natural markings. In most cases, prominent features appearing above the water surface (i.e. dorsal fin, back, flukes) are used for individual identification as these are most regularly observed. Variations in colour patterns, skin patches, body scarring, and nicks and notches along fin edges all provide information as to the identity of an animal. Photo-identification (photo-ID) is when researchers try to obtain high quality, high resolution images of identifying features. This technique has been used successfully from a variety of platforms (e.g. land-based, research vessels, whale-watching boats, and aircraft). Detailed records of individual sightings can then be kept over decades, documenting the life of an animal. The process of computer-assisted matching is being increasingly developed; however, currently the human eye has proved the best method of confirming matches of photo-ID images. 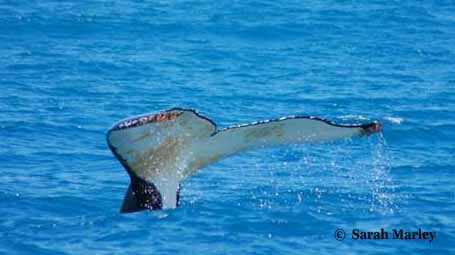 Blue Whale: pigmented mottling on their backs and dorsal fin. Humpback Whale: black and white patterns of the ventral surface of the flukes; nicks / notches to fluke edge; dorsal fin shape; scarring to dorsal fin, back and flukes. Right Whale: callosities (raised patches of roughened skin) around the head, eyes and blowhole. Killer Whale: light-coloured saddle patches behind the dorsal fin. Spotted Dolphin: extensive body speckling (which develops with age). Bottlenose Dolphin: scarring to the dorsal fin and nicks / notches to trailing edge of the dorsal fin. Harbour Seals: presence and complexity of spot patterns along neck and stomach. Florida Manatees: scars from boat collisions present along the back, body and flukes. Chris Burton (Western Whale Research) has been collecting photo-ID data on the blue, humpback and southern right whales of Geographe Bay since 1994. He originally collected this data from whale-watch vessels, but he now primarily conducts photo-ID from his small research vessel Bluey or from land. During the whale season you can often find Chris down at Pt Picquet, taking photos of passing whales from the rocks. This data helped build the foundation of SouWEST, by describing what whale species were using the bay, when they were present, and how different cohorts utilised different areas. As our research continues, photo-ID will provide us with detailed records of individual whales, allowing us to document the life of an animal. 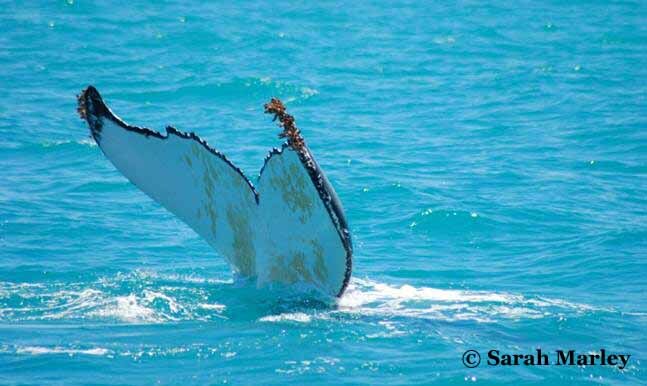 This provides important information for the management of whale species in Geographe Bay.